Attention Restaurenteurs! 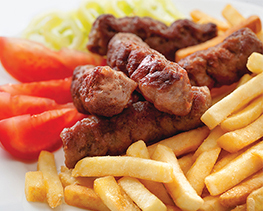 Find out how Deda’s Cevapi can be a profitable addition to your menu. Contact us today! Since 1987, Grandpa Louis has been making homemade ćevapi using the old world family recipe handed down from generations past. Each sausage is 100% all natural with no fillers or preservatives with just the right amount of seasoning. Today, your family can enjoy the gourmet sausages in a variety of different ways. 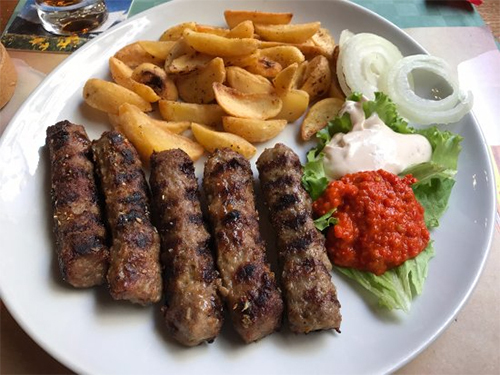 Ćevapi are delicious, mouthwatering, delightful, lip smacking and yummy; but the best part of all is that they are simple and easy to prepare. Your entire family will be enjoying them in minutes. What you do with the leftovers, if you're lucky enough to have any is only limited to your imagination. Enjoy the following creative ideas! Busy people need quick breakfast ideas, and that doesn't mean a drive-thru window meal to start the day. Ćevapi sandwich for lunch is the perfect meal filled with proteins that we need to help us get through our busy schedules. Nobody likes spending hours in the kitchen preparing complicated meals when they could be having fun with their family. Therefore, introduce Ćevapi dinner to your family. Ćevapi make a great snack. One can enjoy them just as they are because they are full of flavour. Simple salads are a great side dish to accompany Ćevapi. Ćevapi can also be served as a garnish. Next time you are making a barbecue feast, grill some Ćevapi as a side or an appetizer! To help you prepare for BBQ season, Deda's is here to offer you a great selection of Ćevapi. It is the easiest way to make food for any size crowd. European, savoury style caseless sausages with just the right amount of spice. Grill, bake or pan fry according to label instruction. Pork, beef, salt, dehydrated vegetables (carrot, parsnip, onions, celery, potato, parsley), sodium bicarbonate, spices. Beef, salt, dehydrated vegetables (carrot, parsnip, onions, celery, potato, parsley), sodium bicarbonate, spices. Chicken, salt, dehydrated vegetables (carrot, parsnip, onions, celery, potato, parsley), sodium bicarbonate, spices. Sitting around a dining table with your loved ones is everyone's favourite part of the day. These recipes are easy to follow and all the ingredients are readily available. 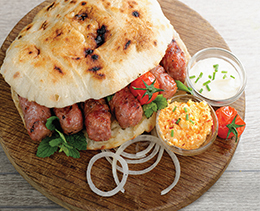 This quick lunch sandwich consists of 5 Ćevapi served in a soft white pita-type bread called lepinja. Grill the Ćevapi on a flame barbecue and leave some grill marks on the meat. Are you in a rush? Don't have enough time to spend around the stove? This quick dinner idea is a perfect healthy dinner meal that does not require much effort and time. Tired of your typical chicken shish kabob? Why not spice it up and make it with Ćevapi instead. Insert Ćevapi with a thick wooden skewer then brush them with a little olive oil. Are you hosting a dinner party? Here is a quick and filling dinner idea. Season your Ćevapi however you like and put them to chill for a bit. In the meantime prep your veggies. Since 1987, Grandpa Louis has been making homemade ćevapi using the old world family recipe handed down from generations past. Breakfast is the most important meal of the day. Many studies have linked eating breakfast to good health. Busy people need quick breakfast ideas, and that doesn't mean a drive-thru window meal to start the day. Eating a high protein breakfast will help you feel fuller longer, so you can accommodate your busy life and hectic schedule. 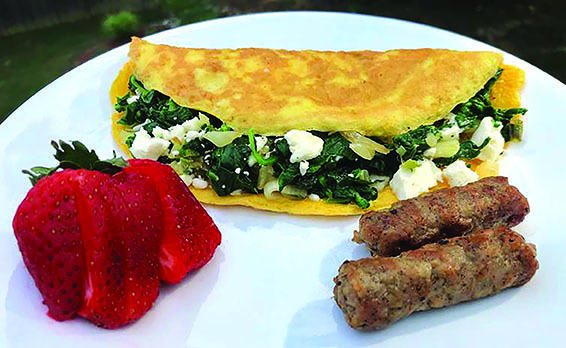 Start by grilling a few Ćevapi and making Baby Spinach Omelet. Place Ćevapi next to the omlet and add couple of strawberries, if you wish you can even add some feta of cheese! It might be shortest breakfast recipe, but it will definitely be the most delicious one ever. Enjoy! Food is what gives us energy. We should always make sure we have a lunch break to help us get through our busy schedules. Ćevapi sandwich could be the perfect quick lunch filled with proteins that we need. The condiments in the sandwich are: creamy cheese called kaymak, a minced sweet red pepper sauce called ajvar and chopped raw onions. 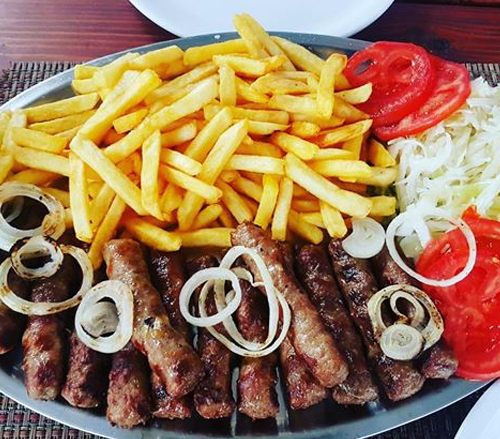 Put the condiments on the Ćevapi, closed the bread back up and take a bite. Eat and dream! When you share a meal with friends and family, it warms your heart. Sitting around a dining table with your loved ones is everyone's favourite part of the day. After a long day at work, no one wants to spend hours in the kitchen preparing complicated meals when they could be having fun with their family. 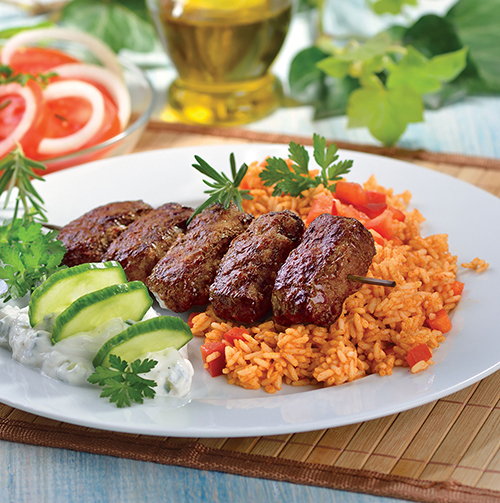 Therefore, introduce Ćevapi dinner to your family. 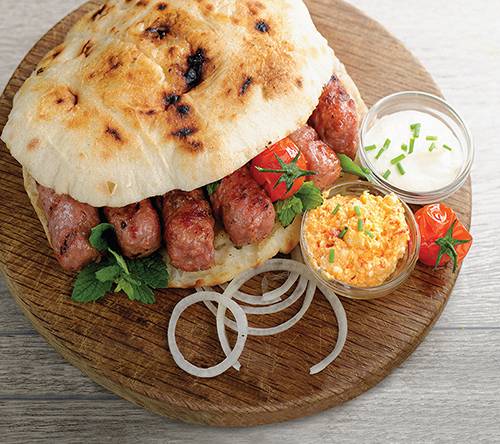 Ćevapi are delicious grilled meat served in a flatbread with ajvar, a vibrant red pepper sauce, making for an easy to assemble supper. On the side you can also serve freshly chopped raw onions and creamy cheese called kaymak. What make great news is that if you have leftovers you can use them to make breakfast the following day. Ćevapi make a great snack. One can enjoy them just as they are because they are full of flavour. 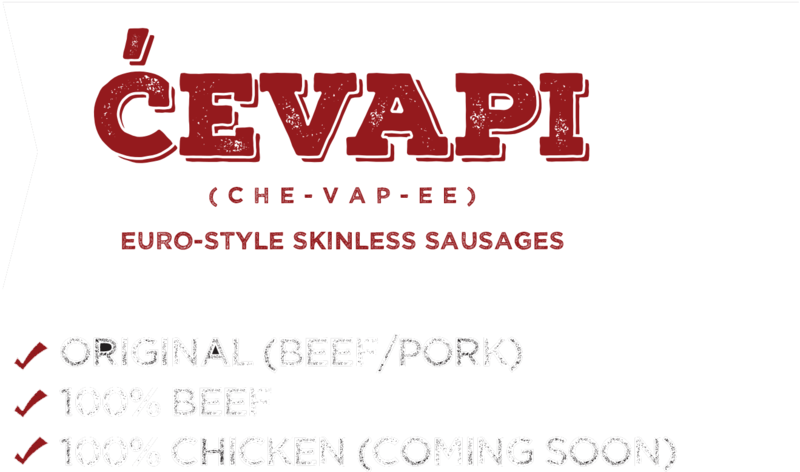 No matter the event, small or big, Ćevapi will definitely be a crowd pleaser. Regardless, how one chooses to consume them, one thing is for sure they will be satisfied. Ćevapi can also be served as a garnish. Next time you are making a barbecue feast, grill some Ćevapi as a side or an appetizer! They can be served over potato wedges or fries. Garnish them with sliced onions and a sweet red pepper sauce, called ajvar, or sour cream. They can also be paired with a chewy flatbread, a light smear of sauce, and raw onion. 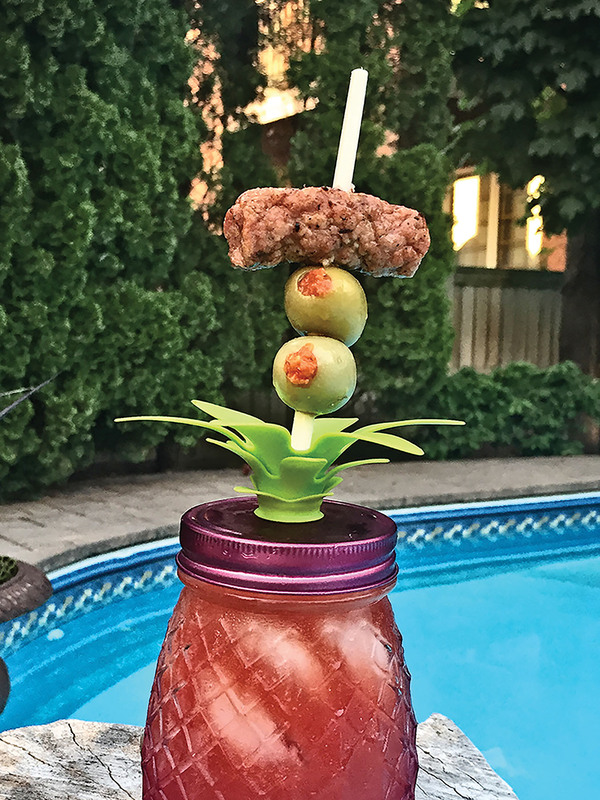 If you make these for your next summer cookout, be careful, your guests might never leave! To help you prepare for BBQ season, Deda's is here to offer you a great selection of Ćevapi. It is the easiest way to make food for any size crowd. Just throw them on a grill and watch them sizzle. The smell of them cooking is intoxicating in itself. Watch your family and friends drool over the platter. No matter the event, small or big, Ćevapi will be a crowd pleaser. Only thing left to do is hang up the apron, get your cevap on and grab a cold one.